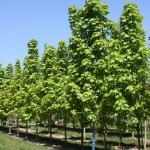 A tightly branched, narrow columnar tree that is an excellent choice for restricted spaces. Short lateral branches grow to create a dense look. The dark green foliage turns to yellow in the fall. As with other Acer platanoides, this is well adapted to many urban uses including tolerance to soil pH range and restricted rooting area.